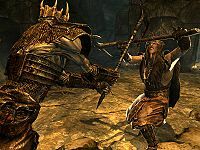 This article is about the Stormcloak version of this mission. For the Imperial version, see The Jagged Crown (Imperial). Find this crown for Ulfric Stormcloak. After you join the Stormcloak Rebellion, talk to Galmar Stone-Fist. Meet up with Galmar and enter the ruins. After taking the oath to join the Stormcloaks, Galmar will offer you another mission. Ask him about it and he will tell you that he knows where the Jagged Crown is, and will ask you to meet with him and his men outside the ruins of Korvanjund. Head there and talk to Ralof, who will be glad to see you again. Galmar will tell you that there are already some Imperials patrolling the exterior of the ruins and ask if you're ready to take them on. Once you reply affirmatively, he will give a quick speech and then lead you to flank them from behind in a stealthy attack. After the Imperials are dead, Galmar and the Stormcloaks will enter the ruins after another short speech. Once inside, the men will all crouch behind a pillar that has fallen down. Galmar will tell you to attack on his signal, at which point you will charge in and eliminate all the Imperials you see. Galmar and the Stormcloaks will start moving as soon as the fight is over, leaving two soldiers behind to guard the entrance. The next room is rather large and empty. In it, Galmar will stop at the entrance to a tunnel and mention that this would be a prime spot for an ambush. He will then tell you to find another way through the tunnel, promising to aid you once he hears fighting. This is one of the few times you need not worry about staying with the rest of the Stormcloaks, allowing you time to loot the ruins. Head up to the second floor and search for stairs. Head up the stairs and follow the path; try to stay out of sight for as long as you can. When you are detected and attacked, Galmar and the other Stormcloaks will rush in to help you. On the eastern end of this room there are more stairs, at the top of which is a chest and the Light Armor skill book Jornibret's Last Dance. Once the Imperials are dead, Galmar will move to the exit of that room and wait for you to catch up. By the edge of the wall by the cliff there is a lever; pull it and get ready for a battle. When you enter the next room, a few Imperials will attack you. Once they are dead, the men will gather around a dead draugr while Galmar explains what it is. Follow the next tunnel to the door that leads to Korvanjund Halls. Once in Korvanjund Halls, you will find a dead Imperial lying next to a dead draugr and a few living Imperials. As you move through, you will notice a few more dead draugr. To your left, there will be a swinging blade trap with a chest behind it. Once you get past the blades, there is a lever on the floor to the left of them that lets you turn them off. Once you go down the stairs, Galmar and the men will remark on the room you find yourself in, calling it "The Hall of Stories" and giving you some background on it. Proceed to the end, where there are two dead Imperials and a puzzle door. Near one of the dead Imperial's hands is the Ebony Claw, which has the proper combination of seals engraved on it. You have to examine it in your inventory to find the proper combination: Fox—Moth—Dragon. Galmar will say that he will examine the walls to find the way through and tell you to look for a way as well. Pick up the claw, put the seals in the right combination, and then open the door. Galmar will congratulate you, then go through the door and follow the tunnel to the next room. This room has a locked gate blocking your way, and Galmar will ask you to look for some way to open it. Look for a doorway with some stairs in it. At the top of the stairs, you will see a table to your right; there is a dagger on it. Moving the dagger causes a secret entrance to appear on the wall. In the revealed cave, there is a trapped chest. Back in the room, follow the catwalks past a wood plank bridge; there is another chest at the end of this passage. Turning around from the chest, as you leave the little alcove the chest is in, you will see a burial urn to your right. Just to the left and above the urn, there is a small handle on the rocky wall. Pulling the handle will cause draugr to rise from their coffins on the lower floor, where the rest of the Stormcloaks are. 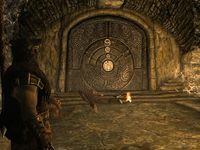 Once the draugr are dead, the men will go through the door to Korvanjund Crypt. Follow them through and follow the tunnel. You will arrive in a room with multiple bookcases. There are two coffins next to a seemingly dead boss-level draugr sitting on a throne. 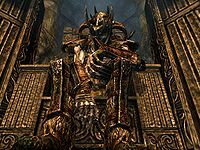 You can either run up and attack the draugr before he has a chance to attack you, which will let other draugr out of their tombs, or wait for a soldier to go up to the unmoving draugr and mention the crown it wears, at which point the coffins will burst open, revealing hostile draugr. After they are dead, take the crown from the corpse of the boss draugr. Galmar will tell you to take it straight to Ulfric. If you talk to him again, he will mention that he will stick around for a while to find anything useful. You are no longer required to follow the Stormcloaks. Behind the throne, there is a chest, and at the back of the room there is a Word Wall for a word of the shout Slow Time. Once you have the word, turn around to find a staircase to a tunnel that leads to Korvanjund Temple. Lift the bar off the door and open it, then turn right and head for the exit. Once outside, after descending the second set of stairs, turn around and face the campfire. Beyond the campfire there is a Master locked gate, which is securing a room containing two coin purses and a chest with some nice loot. Head back to Windhelm and head into the Palace of Kings to give the Jagged Crown to Ulfric. He will immediately start the next quest, Message to Whiterun. Alternatively, if you decide that you really want to join the Imperial Legion, you can take the crown to General Tullius in Castle Dour in Solitude and ask to join the Legion. After giving him the crown, he will let you join and you will start the next quest in the Imperial questline. The Jagged Crown can be worn at the same time as a dragon priest mask or a circlet. If you want to postpone this quest to keep the crown, there are no repercussions (as long as you don't get the 1.4 update). You can still switch sides by taking the crown to General Tullius and joining the Imperials. Even if the crown is given to General Tullius, the journal will still say you gave it to Galmar Stone-Fist. Even if you do not kill the Imperials outside Korvanjund, they will be dead once you have cleared the ruins. Starting "Season Unending" after finishing "Joining the Stormcloaks" would prevent The Jagged Crown from starting properly. It is possible for Galmar to get stuck in the final room of the dungeon, repeatedly telling you to take the crown back to Ulfric. This does not immediately have any repercussions, but it will prevent Galmar from being in Ulfric's office when you return Ulfric's axe in Message to Whiterun; without him there, Ulfric cannot give the order to march on Whiterun, preventing progression in the Civil War questline. 10 I've decided to help the Stormcloaks drive the Empire out of Skyrim. I should talk to Galmar Stone-Fist to get my first assignment. 30 I've decided to help the Sons of Skyrim drive the Empire out of Skyrim. My first mission is to help Galmar Stone-Fist retrieve the Jagged Crown from the ruins of Korvanjund. The following empty quest stages were omitted from the table: 0, 1, 7, 20, 40, 42, 43, 45, 54, 60, 61, 62, 63, 65, 70, 78, 80, 81, 100, 102, 103, 105, 110, 120, 130, 135, 140, 150, 160, 162, 170, 171, 172, 174, 175, 176, 178. On the PC, it is possible to use the console to advance through the quest by entering setstage CW02B stage, where stage is the number of the stage you wish to complete. It is not possible to un-complete (i.e. go back) quest stages, but it is possible to clear all stages of the quest using resetquest CW02B.